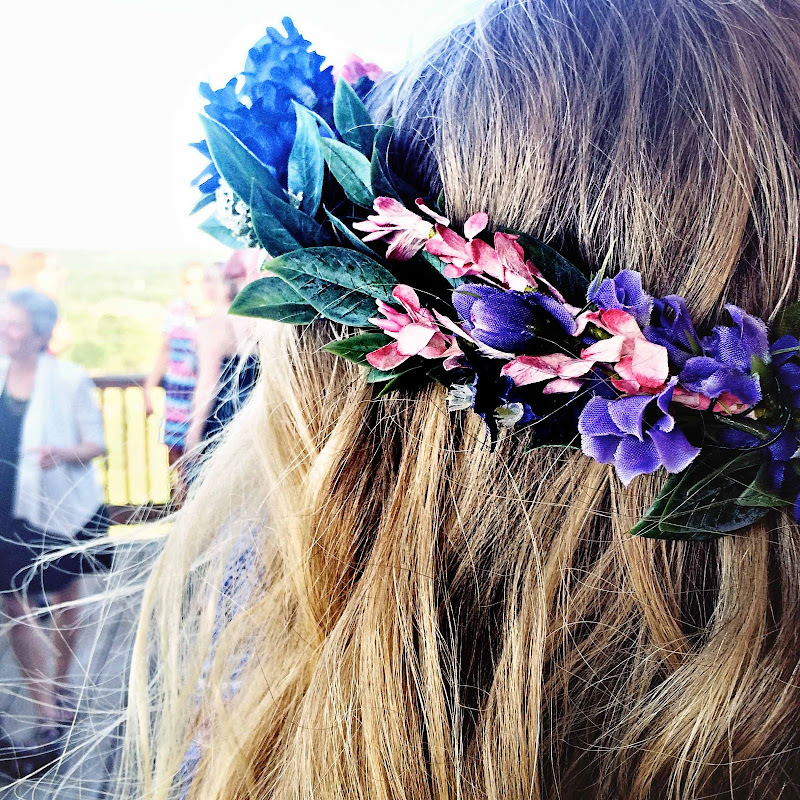 and fancy flowers in her hair." I posted a bit yesterday about my weekend jaunt to Connecticut to attend my nephew's wedding, and welcome a new niece into the Fam. Our family has grown by leaps and bounds this past year due to weddings. Knowing the free spirited nature of our soon-to-be new family member inspired a good natured game of "What WILL she wear" amongst Thing #3, Thing #1.2, and myself. Keeping in mind the wedding took place on the beautiful grounds of a Christmas Tree Farm, and the reception was in a big red barn...my guess was a melding of Boho Hippie Chic. Thing #1.2 agreed and went a step further claiming dibs on a "flower crown". Thing #3 disagreed wholeheartedly on the entire concept. The Better Half asked...what IS Boho Hippie Chic? and was immediately kicked out of the game. Remember, links from blogs, Instagram and Flickr accounts are welcome. All links not adhering in some capacity to Song-ography will be deleted. Thank you for joining in, linking up, and/or commenting. All are appreciated. Please take time to visit some of your fellow Song-ographers. Who knows, maybe you'll get an idea for a future song you'd like to use. Not to mention you'll be amazed by the talent! Thanks again! Please feel free to join in on Tuesdays! I hope you didn't think I was unhappy!! I get to put more thought into songs that tie into whatever I have to share - that's a good thing (-: And naturally, I already have 2 more song-posts ready to go in drafts!! I love the idea of Boho Hippie Chic! Love the Boho Hippie Chic and the freestyle song*ography - both a fitting departure from the structures of winter and the carefree calling of summer. Maybe it is my new "Boho Hippie" approach, haha. I love these kinds of weddings! I think they are the most fun to photograph, too. I don't mind either way on the prompt thing, but I am feeling relief this week with the freedom to chose. I have been struggling with specific themes or prompts all of May due to time constraints and I want to participate and support all of my bloggy buddies. I thought I'd be disappointed not being given the song for the week. But as I look at everyone's selections I am having a lot of fun. And It is a lot easier to match a photo to a song than the other way around. I didn't know your song choice so I'm off to listen to it. Great photo and looked like a great wedding. Glad you are enjoying it Jackie! That looks like a dream wedding!!! You are always so creative with your composition and angles. This will be a treasured shot for the bride, I'm guessing. I'm not unhappy with free choice, either. It just takes more thought -- not a bad thing at all! It's fun reading the variety of choices this week! Thanks for hosting :)! Thanks for joining in Sharon! That's one wedding I'd have loved to have gone to! Not everyone likes change, but 3 years? sheesh...that's a long time....congrats on a successful meme Kath.! I was a bit disappointed to take that bit out of the challenge, but I do understand how much work it is. I love Song-ography, so I'm supportive of whatever keeps you hosting. Thank you so much! I love those flowers in her hair. FABULOUS idea Molly! I can certainly work with this idea. Thanks! You are a lucky woman to have such a big and wonderful family, Kathy. And they are lucky to have you being (among many other things I am sure) such a great photographer. After a little absence I just browsed through your recent photos of wedding and proms - so beautiful. On a different note, I can totally see that some would rather have a strict prompt, it takes the thinking out of the linking - hahaha - once I've got my act together again, I will sure be joining in the free-spirited Songography fun again.